At the NC State Tabletop Game Club I attend five people were playing my prototype “The Rise and Fall of Assyria”. Someone came by and asked if the game was like Britannia. I answered no, because this game is much more fluid, is designed for 3 to 5 players, has less randomness in the combat though still using dice, has simpler scoring, and involves the rise and decline of empires rather than ones that can in some cases play through the entire game (as with the Welsh and Picts in Britannia). But later I thought that compared with the other games that were being played in the room – we had over 50 people that day – the game is much like Britannia. Because they are both games that require “strategic thinking” (strategic in contrast with tactical, though also in the sense of having to make difficult choices about the best play) that are also games of maneuver and location. And they are both wargames. In contrast most of the games that are played at this game club do not involve maneuver and location nor are they wargames. For example, one of the most popular games at the club is Red Dragon Inn. In this game each player is a fantasy adventurer who has just come back from a successful adventure and wants to spend his money gambling and drinking until comatose (or until he runs out of money). The player who keeps some money and is awake when others are comatose wins the game. Each player has a unique deck of cards that he can play plus some money tokens and so forth. Obviously this is not a wargame. Perhaps not so obviously, it’s not a game where spatial location plays any part, and that virtually always means that maneuver plays no part. The game at the next table was Agricola. I’ve not paid a whole lot of attention to the game, because I’m not interested in pretending to be a farmer, nor am I in sympathy with Eurostyle games. But as I understand from talking with players and limited observation, location in the sense of location relative to other players’ assets - spatial location - plays no part in the game, just as is true of a great many Eurostyle games. In many Eurostyle games the board or what passes for one is used to keep track of information, not to show maneuvers or relative locations. Some of these games have “worker placement” but what you’re doing in that situation is recording which option you have selected. You could just as well use tokens or cards, and take a token or card when you “place” a worker. Many of these games are turn order games and the turn order might be represented on the board as in Last Will, but there is no actual location and no placement in the sense of occupying a particular spatial location. In a sense they are not “real” boardgames at all. You can write down all the statuses on pieces of paper and still play the game, or you can use tokens or cards to represent turn order or worker placement and still play the game. While you can write down the positions of pieces on a chessboard those positions have no meaning except in relation to where the other pieces are: they have spatial locations. Another way to look at this is that traditional strategic games and virtually all wargames are geographical/spatial games. One place is not the same as another and the relationship between the locations of those places is important. As this corresponds to the real world, it may provide a feeling of familiarity to some, and it certainly helps model real-world situations. Magic: the Gathering is by far the most played game at the club. I’ve asked players specifically whether spatial location matters, and my impression from having watched Magic and Yu-Gi-Oh a lot over the years is that they are rarely if ever games where location is important and almost never games where maneuver is involved. The cards are placed on the table as record keeping markers. When you “tap” a land you’re recording that it has been used. There are different zones in Magic: the Gathering that indicate the status of cards but those are not spatial locations, those are record-keeping or status tracking. Not all the other games being played at the club lacked maneuver and location. Probably the most popular game other than Magic is Betrayal at House on the Hill. A great many of the club members who play games other than Magic are essentially role-playing gamers who also play board and card games. Our meetings are too short and too loud to accommodate RPGs during the meeting, so people play RPGs at other times as arranged. Betrayal is a story driven game much as an RPG can be. It does have a considerable element of maneuver and location as the players explore the old mansion, drawing tiles to add rooms to the mansion and moving from one place to another. Once the “traitor” has been identified maneuver can become quite important as various characters are trying to kill each other off or find particular items or go to particular places to use particular items. I wouldn’t exactly call it a boardgame in the traditional non-commercial sense but it is a game where maneuver and location are important. Another popular game is Dominion, and Ascension is another deck building game that is played a lot. Clearly Dominion is a game where the cards are used to keep a record of what’s happening, as well is to provide randomization. Information hidden from other players in the cards in each player’s hand is at least theoretically important despite the low levels of player interaction in this kind of game. That is, if you knew what cards the other players had you could gain an advantage in play. It may not be surprising that many of the games, like Dominion, that have only atmospheres and not themes – that is, the so-called story does not actually affect how the game is designed and played – are also games lacking entirely in maneuver and location. 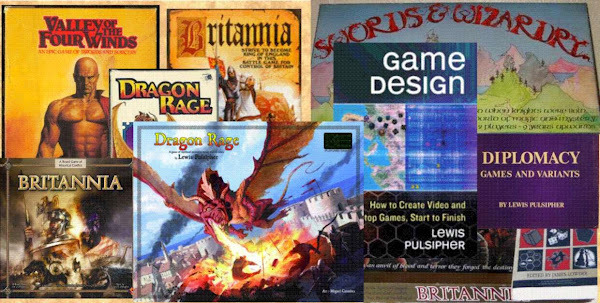 So in this sense almost all wargames are like Britannia, and all those other games I’ve mentioned that are played at the game club are not. Betrayal is the only one that goes in the distance toward Britannia and wargames in general. Wargames also tend to be games of direct conflict, whereas many games played at the club are not (Magic: the Gathering being an obvious exception). That is more obvious, and we can talk about that another time. I’ll have more to say about maneuver and location in contrast other kinds of games at another time.